It was only quite recently that I took my first ever trip to Kielder Forest & Water Park. Considering my global travels, to not have taken the 90-minute drive north seems like something to almost be ashamed of. Especially when you find it is so beautiful. To the west, it’s a similar distance from home to the Lake District, a journey I’ve made many times. So, why not Kielder? My wife had mentioned it on many occasions, but I’d simply never got around to it. However, earlier this year, we got up early one Saturday when the sun was shining, I slung our bikes on the back of the car, and headed off up the A68. Having recently started a contract with Northumbrian Water, which owns the park, I had decided I finally had to find out what all of the fuss is about. To say it was a trip I had planned doesn’t mean “well-planned”. Yes, I had read that the Lakeside Way was just over 26 miles long. Surely, that was easily achievable. After all, the name “Lakeside Way” clearly represented a ride that would be flat? No. We took it easy and, despite the many ups and downs, rode the distance from Tower Knowe to Tower Knowe in around four hours. It was the first time my wife had been on a bike ride in something like two years, so without being patronising, it is clearly a ride that isn’t solely for the enthusiast. It’s a ride that can be taken as lightly or as seriously as you wish. 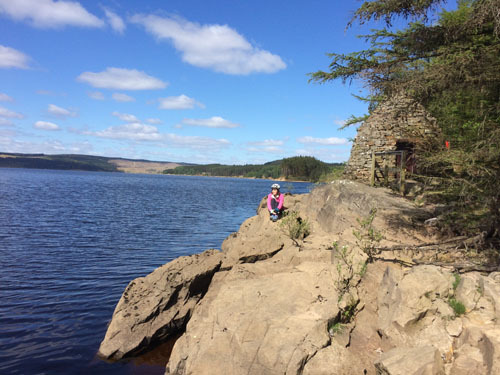 There are plenty of places to stop and enjoy the wildlife and a stunning art and architecture collection and, around eight miles from the end, the Kielder Waterside Park (previously known as Leaplish) is a great resting stop, where you can enjoy a meal at the Boat Inn. Admittedly, my body wasn’t so happy after an hour’s rest and a nice meal when I decided to set off on those final few miles. This trip simply scratched the surface of Kielder, where plans are underway to make it the “best in Britain”, with new luxury lodges being developed at the Waterside Park. With the history of Kielder Castle and the area’s thriving art collection, there is a trip to Kielder for all enthusiasms. The Kielder Ospreys are a great example of species being reintroduced to our region and, with everything from the tiniest birds through to these beautiful creatures and even buzzards, it’s a place for wildlife lovers as well as adventurers, food fans, history lovers, or just people wanting a great break. And to think it was all created to help supply water to parts of our region as distant as Teesside.